The recent time has seen the shift in urban planning concerns of our cities, especially second tier cities. The emerging paradigm of SCM is aspired to be moving towards formation of reactive, reflective and knowledge-oriented society. The SCM is expected to move from functional, hierarchical formation of our cities to networked form. The stated goal of the Smart City Mission is to promote economic opportunity, improve governance, and make cities people friendly. The attempt towards SCM is to bring digital based dissemination of information and knowledge about the city, it is also assumed to have digital based structural and functional operation of city along with controlling, monitoring and integrating critical infrastructures of the city. Along with the management and dissemination of information about infrastructure, it is also expected to re-configure the spatial formation of urban form, new means of achieving high densities, mobility networking, leisure and occupational necessities. The outcome of such endeavor is expected to influence the areas such as participation, entrepreneurial dimensions so that it brings about an equitable growth to our cities. In such context, the smart is conceptual model and not technique of planning, where digital data is an asset and important planning tool. It is also envisage in form of being progressive, transparent and information oriented planning process. Would it be a slightly exaggeration to state that the Cities are being re- engineered with Techno-Utopian discursive construct to promote neoliberal rationalities or is it narrow way of knowing urban phenomena or new planning paradigm based on rational epistemology. If this questions have unclear answers then the politics, technical and epistemological of smart city initiatives need to be examined & critiqued. How every day is seen in a permanent state of emergency and urgency becomes the paradigm of action or how visual technologies are central to the ontological and practical configuration of cities or how data drives the urban transformation, hierarchies and rearrangement of urban life. These are the some of the fundamental question that urban research needs to focus on for coming years. The word “academics” and “technology”, if independently dissected through epistemological perspective, perhaps the manifestation that emerges out could be compartmentalized and self-contained, however the academics of technology together as a singular entity allows to resonates paradigmatic shift from the technology as means to technology as a way, it allows to bring about the scholastic attitude towards shaping the academics based on technology. If the academics is the representative of didactic end in terms of the technological, sociological and ideological manifestation than academics of technology is an attitude towards technology, from belief and ideological point of view. The technology based pedagogy is spoken recursively in heavy accent, historically as well as contemporary times, within the academics. It is perhaps often represented the view of advanced technocrats, who are trained internationally or those who views technology as primarily a discursive and prescriptive imagination of architecture or those who believes that technology as an unnoticed subject to the cult of protagonist of design or those who are trained as an architect but incompetent into internalization of the modalities of architectural thinking. In all the cases there is an impatient emergence of unnoticed ideological cult that is imagined to be as triumphant in architectural academics. The appeal towards technology within such circumstances is not necessarily an academics one, but rather entitlement one, which is tending towards an endorsement of subject, without search for pedagogic mean. The truth in the description above is perhaps not fully sharp enough and it can’t still be isolated within the wings of criticism. The truth lies in the divide that has been created within the architectural education by virtue of technology as a subject that trails the design and design domain is outside the scope of technology or technology domain is design resolution. This divide has not only build the discipline barrier but also build the cult of technologists that are comfortable enough in the production of similar language so that such academics have produced historically are so monolithic, unimaginative & repetitive and continue to do so in contemporary times. The operative fault line here is between those described as mainstreamed of multi-disciplinarian design thinkers with world view and those who see themselves towards the cultural of technocrats as mainstream of solution providers. The academics that happen between such conditions largely determine the limited discourse on technology and shape the future professionals. The multi-disciplinarian world-view thinkers & cultural of technocrats mainstream as solution providers stand for self-loathing that challenges and dismantle the relationship that are imperative to be central to architectural discussion i:e design and technology. Such situation of pedagogic imagination produces the strange Cartesian coordinates, where multi-disciplinarian world-view thinkers moves from margin (global architecture) to central (technology), where adaptation and contextualize process is replaced by solution driven ideas (example Parametric or sustainability or green building technology). If one takes liberty to use the same framework, it is not exaggeration to state that the any discussion on academics based on technology in Indian context, not only imagined to brings sense of dis-comfort but also, often, illegitimatize the process as design pedagogy. The divide is deeper and cultural one, which is propelling and informing many academic debates of our times, which in turns produces the chauvinistic culture of academic, and accolades self to be an intellectual with moral superiority which empowers to pass judgment on the architectural pedagogy. If the argument could be taken forward for better understanding of the width of disparity, the designer world view employs the standards that are often out of context and discriminating in nature (user, gender, religious practices, culture and social practices), while technology point of view this aspects are marginal and not culturally aligned with the standards of technology that are being professed since the emergence of an architectural education in India. The progressive thoughts and regressive prescriptions are never meant to align to the contemporary needs and envisioning future, in turn it never serves towards collective didactic end. The entire architectural education thrives on pockets of ideological patronage that has been historically created and professed, in turn the architectural education with respect to design & technology is now loaded with cynicism and platitudes towards each other. 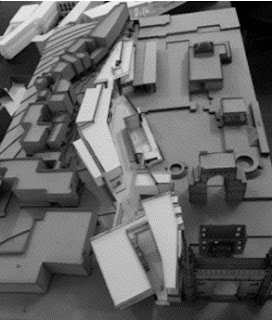 Having argued the disparity within the disciplines and issues in reconciliation of various domains, it is perhaps time to discuss the position that institute needs to align itself so as to allow resolution of all the forces of technology and its responsibility towards architectural education and society at large. There are few fundamental questions that needs to address first prior to any attempt in reconciliation process. 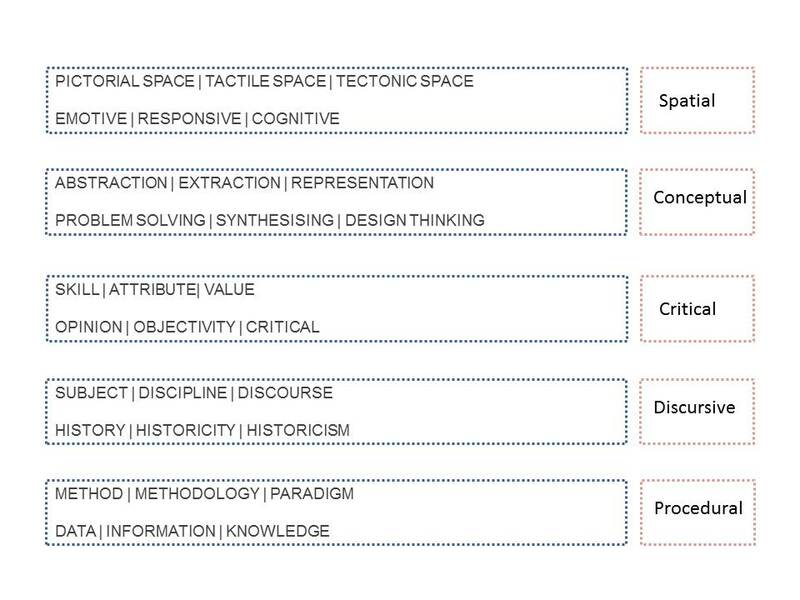 This is absolutely becoming imperative to address as architecture profession has never been challenged than in contemporary times to attempt to re-orient the historically evolved insight into technology and nature of praxis. To substantiate the argument of re-orientation, it is necessary to state forth the example from history where such relationships are understood and allowed it to develop as large part of architectural pedagogy. The trained architect Jean - Nicholas – Louis Durand (1760 – 1834) attempted to evolve within the standard curriculum. He argued that the architectural education is not enough to evolve with complete architect but it has capabilities to develop an attitude towards architecture and nature. He developed didactic material based on the principles that are originated form the post-revolutionary, proto-industrial approach. These ideas were combined with the systematization of the process of architectonic composition through methodical approach. The whole experimentation is not to standardize but to develop the typological innovation which has capabilities to demonstrate the alternate combination possibilities. Such pedagogy allowed demonstrating the production of walls into skeletons, monolithic structure into ribbed structure and support versus infill types of construction which dictated the technology for many decades. His contribution had been decisive, theoretically and most importantly methodological shift in paradigm towards the “immaterialization” of the structural systems and tending towards conceptual one. The Durand case is not for demonstration of new technology but to articulate the argument that any sustained models embedded within history need viewing from the condition of time with different perspective, in order to determine the diverse possibilities with continuous reflection for the development of new didactic models or school of thought. Beyond between means unraveling the time frozen paradigm, re-looking at history as history of ideas, it is necessary to build discourse, role of history and its imperatives, so that the pedagogy within the architectural education is dynamic and well within the reach of its didactic end. In order to expand the conversation on discourse on technology, it is imperative to understand the divide of realm of world view and culture of technology within the existing system in defining role of architecture as profession. Over and above the endless divide of two domains, there seem several parallel realms within each domain due to several factors. 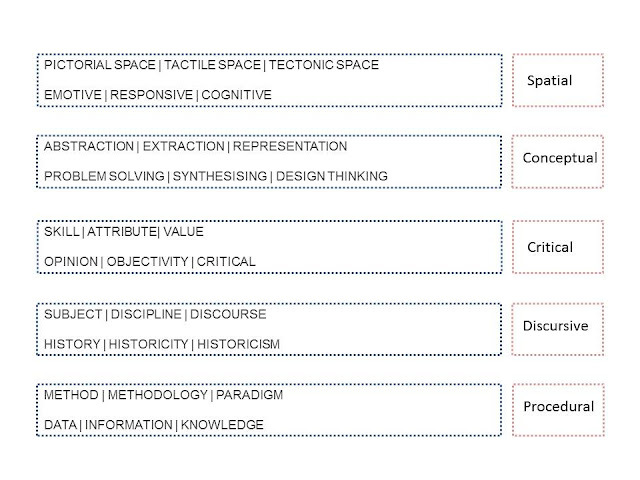 The most debated one which in particular pushes the technology based conversation to margin is the school of thought or ideological condition which determines the nature of architecture pedagogy and its embedded conditions with respect to technology. 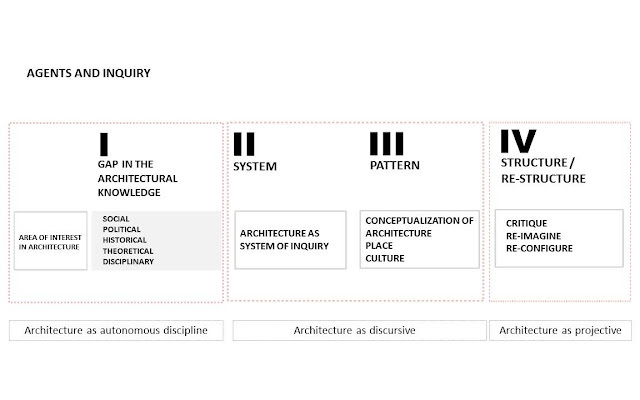 The characteristics of an architectural inquiry and research paradigm has shifted considerably from design discourse to urban discourse, while technology is dragging the baggage of redundant and outdated forms of content and method. The neither realms is able to be consistent and synchronized with the nature of inquiry system and modes of production of architectural manifestation. To strengthen the argument, the technology is divided based on the material conditions which are engineering domain while the architectural inquiry is always within the realm of sociological and cultural dimension of urbanism. In order to pull the sociological and cultural perspective, where any conceptual development of tools that are necessitated for architectural end is rather superseded by inquiry that are remotely connected to architecture, while any attempt to have manifestation such ideas in technological perspective is far from reality, on other side technology continues to work around the colonial method of “trace the template”. In other words the role of technology is reduced to a subject and not the overall part of architectural discourse. Technology has capacity to produces a well-defined world view thinking and cultured attitudes towards the manifestation. The technology needs further articulation and embedded conditions in plural sense. Such conditions are possible only when it blurs its regimented boundary of solution provider to disciplinarian entrepreneur. 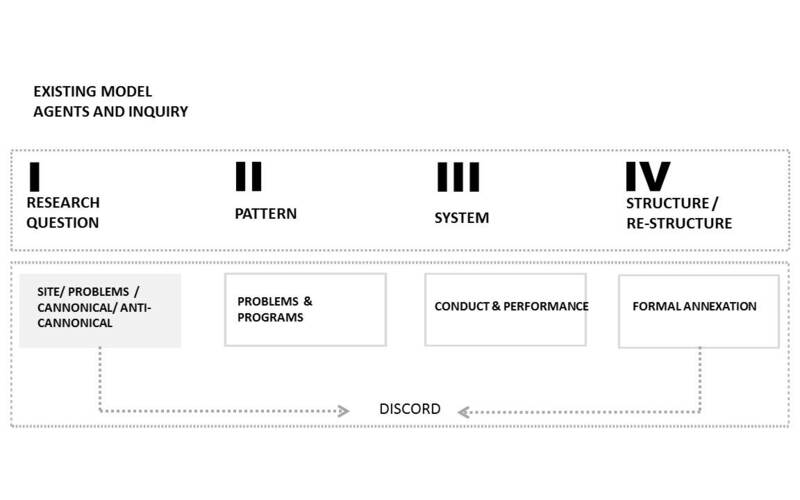 One of the possible ways to pave the path for embedded condition of technology within architectural pedagogy is about creating interdependencies. The interdependencies model enables the theory, practice and research outside the core domain with multiple variables to determine the interpersonal understanding of core. The relationships between design and technology are not mutually exhaustive rather it’s a symbiotic one where enables in creating new systems and values which is whole lot of social and cultural enterprise that determine the evolutionary and sustenance conditions. The idea and responsibilities of technology is not just limited to the acquisition of methods or the technology means not just limited to techniques and tools, it is about cutting across the disciplines. To elaborate the idea of technology as key concept in abstract sense or in conceptual terms, it is about cultural, sociological as much as technological. The compartmental description of technology weakens the integration and interdependencies process and turn technology into a subject of consumption rather than discipline of praxis. The recent research in technology has argued out the term “appropriate” instead of “absolute/ standard”, it means the generic concept of technology is systematically replaced by context based appropriate technology. The appropriate technology is focusing on idea of various forms of technology, ranging from low tech, high tech, frugal to domesticated technology. The larger idea behind such dissemination of scale is meant to understand technology from its traditional terms, intermediate technology to advanced technologies. The scaling of technological ideas allow the research ranging from localized frugal technology embedded into the realm socio cultural dimension of innovation to intermediate technology being to negotiate the socio/cultural dimension and engineering domain while the high key technology begins to implement the third tier of tools and conceptualization. Hence the conceptual framework shall enable the value of a technology be continuously evolved and consolidated by the social, cultural, economic and political milieu. Technology is a body of knowledge that integrates and enables the process of making at various scales. The ideas of material based technology and framework based are tools that allow the model to expand into the newer territories for collaboration. Within this definition of technology has possibilities to contextualize and appropriated within certain geography and time frame. 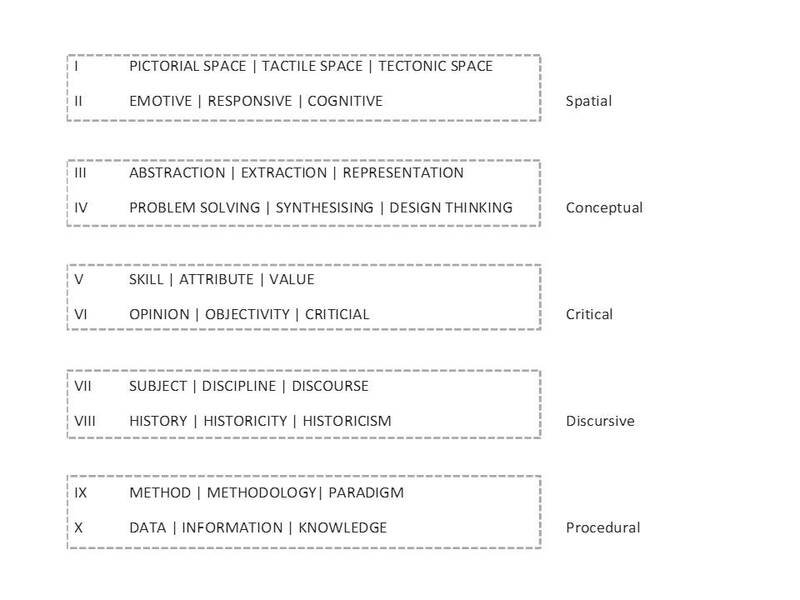 There are some simple terms that we often use to frame the pedagogy for architectural education. The simple terms are sometimes confused with many other terms. The elaborative work on architectural theory across the time have propagated some of the larger concerns emanating from some simple ideas and words. The thought and trouble with such theoretical terms are in our inability to articulate the difference among several terms. It is necessary for an institute to articulate the some of the basic difference among the few terms that we often use as tool or concepts as teaching material. It is also necessary to understand the configuration of these terms that enables one with larger architectural thinking processes and architectural debate. This is true to the fact that, every act of design and discussion is also theoretical positioning of self and context. The architectural theory is more than unfathomable text and every institute must articulate and make it as vital component of architectural pedagogy. These components are fundamental to the foundation from which architecture as practice or discipline asserts a particular position or establish larger value system of architecture. It is through such analogical structure one develops the alignment to architectural thinking and critical edge. The terms and its definition shall be discussed in subsequent blog. The Japanese architect Arata Isozaki’s work could best be explained in terms of theoretical in-between conditions or ambivalent in nature that most of the architecture desirous to move away from. Those conditions are exemplified in terms of mannerist to austerity, explosive utopia to repressed creativity, controlled architectonics to naïve & intoxicating casualness, reactionary to cultural nostalgia. As a part of metabolist group in sixties (along with Kenzo Tange, Kurokawa, Kikutake etc), he appeared to have reacted to the alighting modernism in the context with reactionary imagination, longing for invigorate manifestation of the east. Later he chose to minimized his connections to metabolist group which seemingly appeared to adorned the exaggerated or overly utilitarian. The decline or disassociation with frantic futurist, gave rise to ideological emptiness, which in general described as being state of “Intellectual fatigue”. Yet the in-between state continues to dominate his work especially the Museum of Fine Arts, where formal expression are austere box with layered spaces with fluid formal generosity. The architecture of the building brought in the rare freshness to the Japanese architecture. The building is perhaps not easy to decipher yet very dramatic experientially. It brings the in-betweenness of formal expanse to dense spatiality. The other building that has demonstrated the similar formal responses in tandem with the western pre-occupation with “postmodern architecture” is building at Disney in Florida. The architecture brings about vivid scenography of an eclectic who is aspired to pushes the architectural representation to its formal limits. The MOMA building in Los Angeles revives his incomplete manifestation of formal, functional & representative which were explored in Museum of Fine Arts. The architecture of the building also brings about the in-between conditions austere to casual, naïve contextual to eclectic (application of Red Agra Stone, dressed in Japan). The MOMA building yet remains the finest and matured work that celebrates the in-between conditions, vividly embedded from user perspective yet seemingly embryonic in representation sense. The large question that one restlessly would raise is the relevance or importance of his architecture in contemporary architectural paradigm. The architectural discourses that are entrapped between the expressionistic attitudes to situationist envision, the Isozaki work negotiates the extremities, it resonates the collage of time and memory, and it brings about naiveness architectural representation in critical manner in other word the mannerist striving for criticality of superficial. The building of institutional architecture has long been obsession of state since independence and the legacy continues till date. 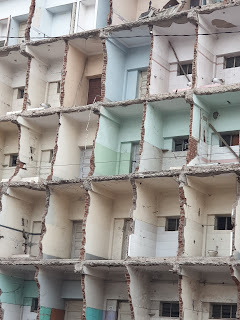 Since then we have witnessed the architecture that are abstemiously struggling to bring about pan-Indian architecture of earlier phase to contemporary global architecture in recent times. The architecture that oscillated from decadence of Indian architectural wisdom to eclecticism of formal annexation in recent times, and both tendencies depict the enthusiasm to embrace the architecture that is contemporary enough, yet has embededness. The degree of experiments are perhaps have similar intensity as well as both the virtues brings about similar paradox, i:e how the idea of intellectual modernity challenging every day, “the rootedness social conditions” making conflicting reality to be perceived as being progressive at the same time vehemently bringing out the experiences away from colonial production. The recently designed and constructed institute building for SPA Vijayawada demonstrates, on one side the similar conditions and traits that are historically developed yet moves away from genesis of architectural vocabulary that has been seen as forced template of post-independence architecture for the state. The architecture of the building has Corbusien idioms in many ways, yet explores it formal interpretation by re-reading/organizing the program. The four layers that are stacked with impounded formal implosion, exploring architecture of non-program, embodying the experiential dimensions that are often missing in the contemporary institutional architecture. 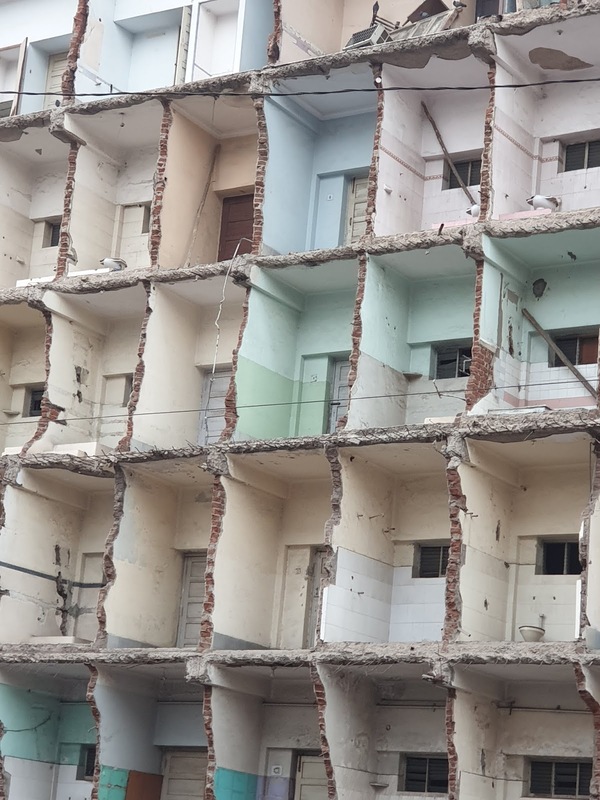 The architecture of the building also depicts some of those brutal tendencies, clearly reflecting the formative circumstances of post-independence experiments with the institutions. The architecture of the SPA’s definitely opens up the discourse on renewed ethics on cherished functionalist notion on one side while challenging the doctrine that comes as pre-determined aesthetics of global architecture. The buildings also bring the subtle transition of modern ethos of earlier first generation experiments by third generation of architects. The building is still in its formative years in terms of its use and yet to be seen the role of such spaces, web of program and non program in coming years which are apparently adding the value to the architecture. The recently published book titled “Lucknow: Culture, Place, Branding & Activitism” is a scholastic urban research work on contemporary urban transformation of Indian Second Tier cities. This especially brings about the urban discourse on second tier city subject whose genesis are embedded into the historic layers and are currently witnessing the rapid transformation. It builds interesting conversation on culture and heritage aspects of typical second tier Indian city with Lucknow as an example. 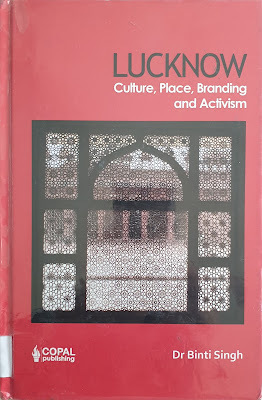 The book has seven sections largely focusing on the reasons for the need of such literature work on Indian cities, the transformation through new imagination in tandem with neo-liberal economy and governance, the quality of urban life, place and urban experience within historic inner cores, culminating into the place making process in contemporary time through cultural activism. The book brings about the concerns on account of diverse and often conflicting imagination, subjecting second tier cities into an object of global representation through symbols, images & formation of urban design policy and practice. It further builds the argument that the global conversation in social and cultural terms produces contestation of strange character, which is unsympathetic to the pattern of evolution of Indian historic cities. The trend is not limited to Indian cities; rather the urban spatial and cultural transformation is witness in global south, almost replicating the archetypical characters of emerging pattern. In author term, attempting to describe the phenomena as “sociologically, globalization is understood as compassing all the processes by which people are incorporated into one singular, global society by compression of time and space” showing the concern towards the dichotomy of “what is lived has moved away into representation” which amounting to the spectacles for mass consumption and consolidation of capitalist production through post-fordist mode of production, engaging simultaneous places and people as production place for branding. The book has valuable account of wealth of theoretical research, their contextualization and emerging questions that are deeply embedded in understanding of urbanism of Indian historic cities. This book is a must read for urban researcher, urban design & conservation professionals and students. Last several decades one could see the altered responsibilities of architecture towards itself, cities, environment and other interdisciplinary dimensions. This has perhaps resulted into need of re-examination of the academics in contemporary times. Within the academics it is important to understand the role and scope of the architectural thesis (design desertion) as a culmination towards making of an Architect. The architectural thesis is expected to demonstrate the fully evolved architectural knowledge system, demonstrated in the form of research ideas and project demonstration. 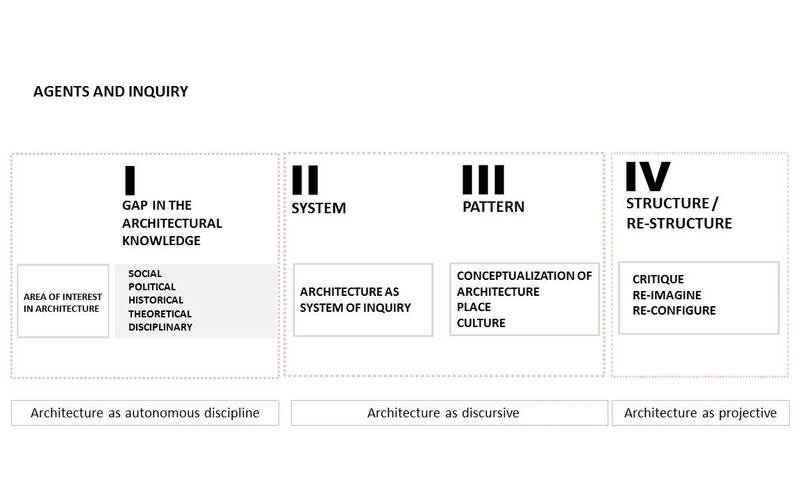 Along with that, it is also assumed that the architectural question would have expanded into interdisciplinary examinations as compare to limited architectonic inquiry in earlier formative years. It is also imagined that such fundamental understanding would give away the traditional forms of problem-solving to social, political, cultural, and / or disciplinary critique within the act of research and design. If one maps the trajectory of architectural thesis over past few decades, it would explain that it had only attempted to articulate the basic issues as being only problem solving method as an architectural inquiry and demonstration. It has unable to articulate the disjunction and discord that it has created in such process, especially in understanding the complexity of layers as an architectural question and nature of architectural inquiry as interdisciplinary value system in architectural thesis. The architectural thesis begins with the idea of the understanding of two terms, the design research and the architectural research. This two terms are often confused as being one or similar but they are different because design research is close ended derives its momentum from data and information, tending towards demonstration and the architectural research is open ended flourishes on knowledge system and tending towards discipline based inquiry and critique. But one should not confused that there are two methods to carry out thesis rather they are dependent on each other so that inquiries can be set towards either from design research to architectural research or vice versa, tending towards conclusive end of design & demonstrates. Traditionally we have built two myths that architecture is about of either “architecture as a profession” or “architecture as a discipline” and we generally try to separate it out conveniently and every act that enables academics is a product of this mythical compartment. When you say architectural research, it’s a fairly open ended form of inquiry and experimentation because you want to engage with a variety of forces and build some new knowledge. They are not necessarily conclusive in nature; they may or may not result into a building. But on the other hand a design thesis research is basically is the way you engage and integrate the idea of profession by addressing the functionalities and technicalities and what is more important is the way you try to be canonical or limit the architectural question and improvise what is already established. This enables the emergence of discord between the canonical structure of knowledge and formal annexation of the building and its relationship with architecture. It is usually understood that the one addresses the problem will, in turn resolve that problem or the conduct of program is architecture. This is very limiting and conclusive without expanding the architectural question. At this stage the architectural system begins to draw the idea of pattern, the forces that influence architecture. It aids the conceptualization process and development of broad ideas specific to sites (place, culture). One can also begin with the area of your interest that you have in architecture. This method allows beginning with the accumulation of work of similar area of interest, almost like an autonomous researcher. The word autonomous means you are an individual, you are a research scholar and you are interested in a particular aspect of architecture which is not really predefined. 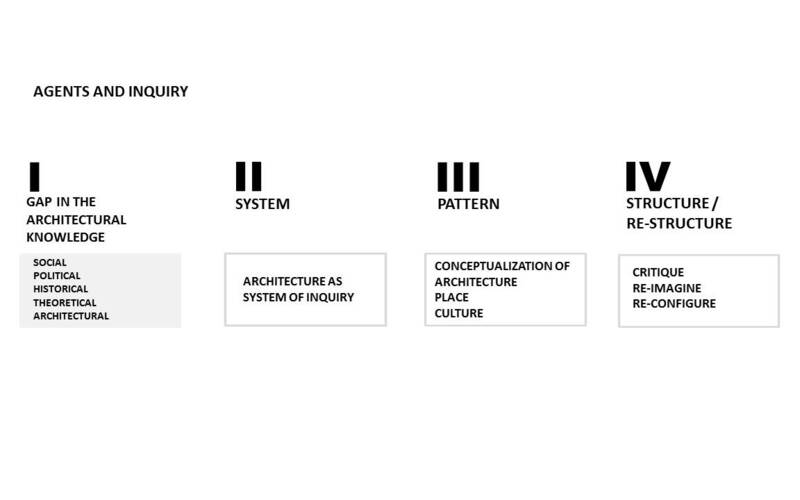 Then we come to the second stage where we see architecture as a discursive means there is a kind of disciplinarian kind of engagement in looking at architectural inquiry and conceptualization of architecture with relationship to the site. Now this is where your site comes into the picture. This is the second phase where your site comes. And the third is where you try to put it together and the kind of formal expression, manifestation. However this is not as linear as it appears to be. One could really swap this process. You can look at architecture as a discursive, as a beginning point. You might think let me just try to examine disciplines. Let me try to understand the relationship of architecture with something that is really important. But architecture remains at the center. So someone might have interest in sociological understanding or an anthropological understanding to begin with but then one needs to articulate the specific knowledge that informs architecture. Now when you reverse this question you are obliged to take up a case study. In this case you need to study what has already been done, what kind of architecture has already been produced, what is the literature that has been produced. The case studies are the prime support for your architectural thesis. Hence one can’t just claim that as a researcher one is re-imagining. The re-imagining cannot supersede one idea of inquiry and discussion and discourse. The re-imagining comes when one is really taking this process in a way which it systematically evolves kind of inquiry that are bridging the gap of earlier research. This is more about generating a discussion looking at the thesis process and it also kinds of brings in the idea of the way in which we understand method and methodology. We sometimes assume that it a research question. Sometimes we assume that we have done research but actually we have only collected the data. You have not yet established the larger value system attached to the data. This point where the dis-junction is and we need to equip ourselves to handle the emergence of dis-junction.